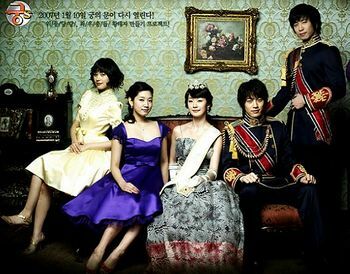 reverse of Princess Hours, but not exactly the same plot. which makes sense, otherwise people will just go to sleep. this time round, it's not about arranged marriages being implemented. but about a guy who finds out he's suddenly royalty, and enters the palace (same concept as Princess Hours - S Korea has a constitutional monarchy). He then finds that he has a competitor for the Crown Prince title, and has to undergo some challenges. Along the way, he falls in love with a palace maid, who was his ex-classmate. She, in turn, also happens to attract the challenger. Along the way, he has to discover the truth behind why his mom was kicked out of the palace which resulted in him being unaware of his royal status. the concept is not new, so there is a lack of freshness here. the lead actor is also mostly just eye candy and lack serious acting skills. well, i guess he is a star so that should be enough for most of those who watch this sort of star-based dramas. nevertheless, i like the Crown Prince challenges, and also the cloak and dagger stuff happening all the time in the palace. the Crown Prince challenges are really quite innovative. the looks of the foursome are easily good enough that you wont need to look away. but i kinda wish the 2 lead actresses switched places.